Does your office always seem cold? Take a stroll to warm up and bring layers. As the temperature starts to rise, the Office Thermostat Settings Wars begin! It is an age-old battle that has gone on in the workplace since virtually the conception of modern indoor central air conditioning. Believe it or not, it is possible to reach across the aisle, and come up with a peaceful resolution, without either party feeling like they had to wave the white flag in surrender. How can everyone in the workplace come to an agreement? Here is some advice regarding ideal thermostat settings for the office. 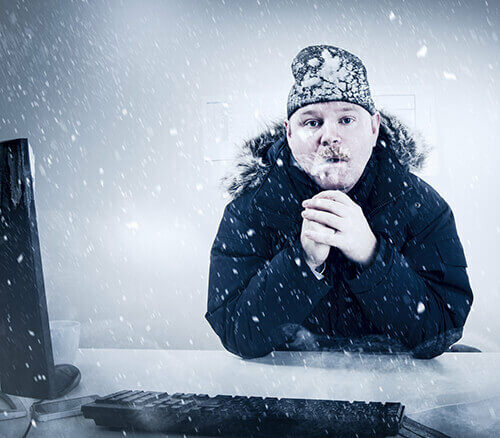 The American Society of Heating, Refrigerating, and Air-Conditioning Engineers (ASHRAE) makes a primary recommendation regarding comfortable temperatures in an office environment: for those employees wearing what is considered an average amount of clothing, the environment neither needs to feel too cold or too warm. OSHO guidelines will take this a bit further to say that temperature controls should be in the range of 68-76 degrees F and humidity control in the range of 20%-60%. It also states that office temperature and humidity conditions are a matter of human comfort rather than hazards that could cause death or serious physical harm. Sometimes your temperature has to do with body chemistry and what you wear. Men are generally warmer than women, but they also tend to wear pants and long sleeves to work. While these guidelines are vague, there is practicality in setting the thermostat to an agreed average with only slight seasonal variations. In the winter, the best temperature is around 68-70 degrees while in the summer, adjust the temp to around 72-74 degrees. 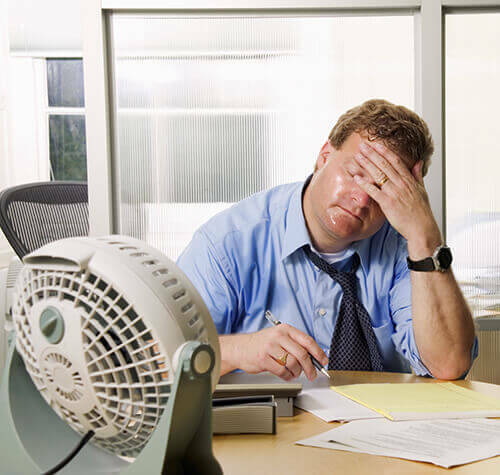 There are reasons to find middle ground regarding the office A/C this summer, sure to quell any interoffice rumblings and keep everyone comfortable. Excessive heat can impair decision-making. According to Scientific American, warmer temperatures require the body to use more glucose to maintain a normal body temperature, depleting the amount of glucose used for cognitive processes. The U.S. Department of Energy reviewed over 24 studies around the world regarding temperatures and productivity. In 2006, they published results and found that, on average, worker productivity decreased once office temperatures hit 75 degrees Fahrenheit. Comfortable temperatures may increase morale. Comfortable employees are happy employees. While an absolute ideal temperature remains elusive, as an employee (both men and women) consider wearing layers, so that you can adjust for personal comfort. Try to find an average upon which everyone can agree. Program the thermostat to save money. While there are not written laws governing indoor air conditioning, reaching an agreement about ideal thermostat settings for the office will not only save you money but could boost morale and productivity.